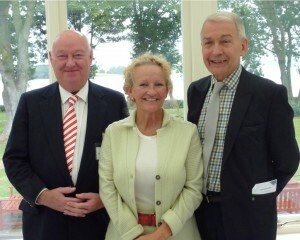 A large crowd of diners attended on a cloudy wet day to hear the words of our guest speaker Frank Field. 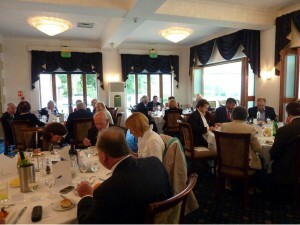 With the backdrop of Rutland Water the attendees enjoyed a super three course meal. Frank Field was welcomed by Geoffrey Pointon and spoke passionately about a strategy which offers the prospect of preventing poor children becoming poor adults. Frank conducted an Independent Review on Poverty and Life Chances and the final report was published on December 3rd 2010. The review had found overwhelming evidence that children’s life chances are heavily predicated on their development within the first five years of life. He said that family background, good parenting, opportunity to learn and development in those early years matter more that money. He said that good maternal bonding, opportunities for a child’s cognitive development, social & emotional development and clear boundaries were critical to its success as an adult. Later interventions may help but the most effective way to help is in those crucial early years. He pointed out that by the age of three 80% of a child’s brain has developed and the experiences of that child shape the way the brain grows, connects and develops. By the time the child has reached school the variations in abilities were wide with children from poorer backgrounds doing worse cognitively that those from more affluent environments. Schools he felt were not able to effectively close that gap as the time to make improvements was before school age. Frank said that a shift of focus is needed towards providing high quality integrated services aimed at supporting parents to improve the abilities of the poorest children during the time period of the early years when it is most effective in cost and results. Such early intervention would increase their prospects of gaining better qualifications and employment in later years. After speaking to the diners Frank took a number of questions from the floor. At the end of lunch all departed in good spirits with plenty of kind words for the speaker.